Scottish Country Dancing is an important part of our culture as well as a whole lot of fun! But you would be surprised by how many Scots can barely dance a step of any of their national dances. It is also surprising how many times in your life, you are at an event, not necessarily even a Scottish event, where an 'Eightsome Reel' or a 'Strip the Willow' is announced, but if you don't know how to do it, all you can do is watch from the touchline! The St Andrew Society of WA offers members (and non-members), a golden opportunity to learn dances that are a whole lot of fun and will come in handy to you for the rest of your life. It is NOT our aim to get everyone up to competition standard! The idea is, that whether you are twinkle-toed or just a shuffler, you can get yourself to the right place at the right time and enjoy yourself while doing it! 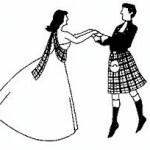 We dance a number of Scottish reels and waltzes at our events, ranging from simple dances to the more complicated ones. Dance classes are usually held before all events and are a superb opportunity to learn the dances or to just come along and enjoy yourself. We have also made videos of a number of the dances we do, for the benefit of those that confuse their White Cockade with their Flowers of Edinburgh! Tip: To view the clips in a larger screen, click the YouTube link in the video once it starts playing (bottom right of window) - it will open in a new Tab Page. Scottish Country dancing is not a contact sport! Dance floors are not always as large as we might like them and dancing should be enjoyable to the old and frail as much as the young and energetic! Please consider others dancers, particularly when the dance floor is crowded - you can, for example, do a lot of damage with a high heel! Taking glasses onto the dance floor is forbidden at SASWA events. Inevitably glasses get broken and broken glasses and dance floors are a bad mix. As an added precaution, dancing in bare feet is also forbidden. When a dance is called and couples are making their way onto the dance floor and forming sets, you should join at the bottom of the line. Pushing in further up so that you can dance with people you know is extremely poor form! 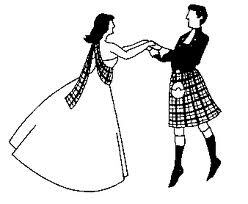 An important part of Scottish Country Dancing, is turning your partner (or another dancer). There are lots of different hand grips that can be used to accomplish this - some designed to give a better grip, others to enable turning to be accomplished faster or with extra panache! There is only one "correct" hold, which is two handed, the gentleman with his hands palm upwards and no crossed wrists. Gentleman, If you are unsure whether the lady you are about to turn is familiar with the 'Inverness-reverse-double-under-arm-flick-turn', offer her your two hands palm up!